October -- Fall bargains and freebies. In order to get new readers and fans--and books to the beach and the bed--we've decided to offer all eBook versions for under $5, and as an added incentive, certain titles will be free on Kindle on certain days. If you don't have a Kindle, be sure to get the free app for Mac, PC, iPad, or iPhone. Click here to grab the first book in E. Van Lowe's Falling Angels Saga, the story of 15-year-old Megan Barnett of Glendale, Arizona, who not only has to contend with high school, boys, and the heat of Arizona, but also Satan. As I write this, it's already the #1 download in Children's eBooks, #1 in Spine-Chilling Horror. We're selling it for just $1.95--to get you hooked. $12.95, print. Click here to own the award-winning first collection of short stories by Christopher Meeks. See the description to the right. Click here to delight in a noir-dark mystery of a fallen police detective who has been pulled back to his home town, Pittsburgh, after one of his former friends has been found brutally murdered. It's from master novelist and screenwriter David Scott Milton. $4.99 Kindle, $14.95 print. Click here to get the second book in E. Van Lowe's Falling Angels Saga. Just because Megan Barnett has won the love of deliciously handsome Guy Matson doesn't mean her troubles are over. Far from it. For Megan doesn't realize it, but in her possession is a powerful weapon, one sought after by both angels and demons and everything in between. $3.99 Kindle, $12.95 print. Click here to discover this novella by Christopher Meeks where two story lines work side by side until they intersect in this strangely funny tale of youth and middle-age. 99 cents, Kindle only. Click here for Christopher Meeks's second short story collection, which made the long list for the Frank O'Connor International Short Story Award. "The short stories in Months and Seasons are like potato chips, you can't read just one," said critic Marc Schuster. $2.99 Kindle, $14.95 print. competition and make every sentence count. This book will help you. It's a powerful tool, with terms defined by a master that gently guide you into a deeper understanding of how to write fiction. It's scheduled for publication on November 12, with a publication party at 7 p.m. that night at Vroman's Bookstore in Pasadena. Please come--open to the public. For over thirty years, Shelly Lowenkopf has taught creative writing in the master's program at the University of Southern California and at prestigious writers conferences. He's also held the titles of Editorial Director, Editor in Chief, and editorial reviewer with publishing houses and university presses. 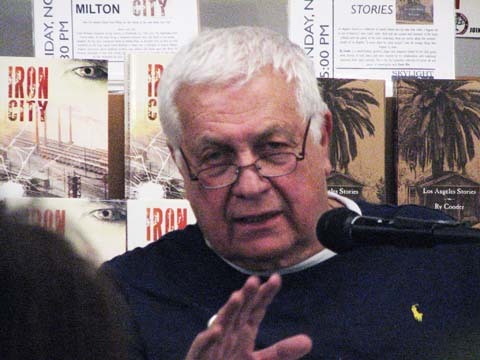 His book reviews have appeared in many newspapers and journals including The Phladelphia Inquirer and the Los Angeles Times. 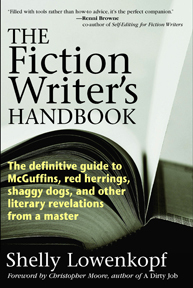 Thus, The Fiction Writer's Handbook offers a full half-century of editorial experience and fiction-writing wisdom. Here are two books that are in print and on the Kindle (and Kindle for the PC, Kindle for the Mac, and Kindle for the iPad and other tablets with the free Kindle software). The first is David Scott Milton's Iron City, a dark noir mystery recently in the Top 20 in Amazon's Literary Fiction list. Click here to learn more about the story and/or for the download. The other book is Christopher Meeks's award-winning fourth book, The Brightest Moon of the Century. It, too, has been in the Top 20 for Literary Fiction and well as the Top 20 for humor. 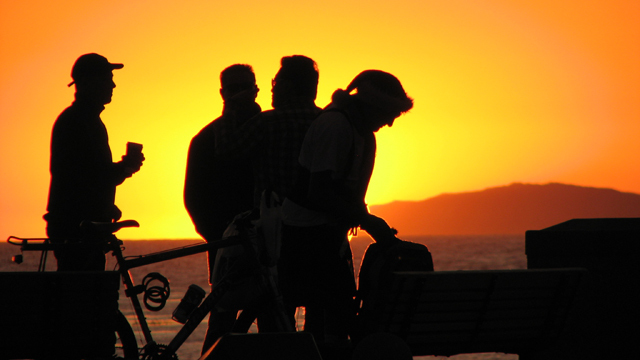 Click here to discover more about the tale and/or for the download. We're excited that Earth Angel, Book #2 in the Falling Angels Saga, is now out. 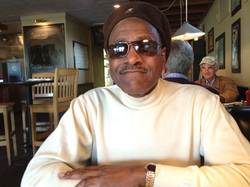 Author E. Van Lowe, a former writer and producer of The Cosby Show, is at work on Book #3. EARTH ANGEL IS READY! THE SAGA CONTINUES. 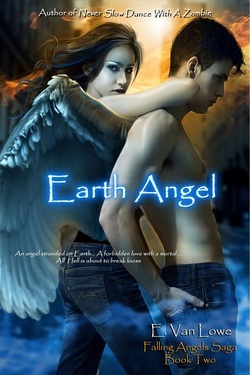 E. Van Lowe's Earth Angel, the second book in his series of the Falling Angels Saga, is now available. In this story, just because Megan Barnett from Glendale, Arizona, has recently defeated Satan, has a best new friend, and has won the love of her life, Guy Matson, her troubles are not over. She winds up in a life-or-death battle to save herself, the angel she loves, and all of mankind from unspeakable evil. To get print or Kindle copies on Amazon, click here. To get print or Nook copies at B&N, click here. Author Gina Nahai (Caspian Rain) says, "David Scott Milton is that rare contemporary American writer whose body of work represents an honest and authentic study of the mysteries of the human heart. 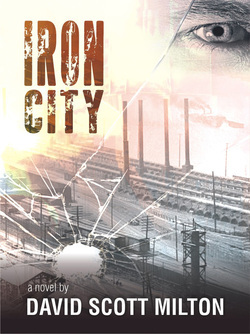 In Iron City he creates a fast-moving and original plot, and a lead character whose pain and passion haunt the reader long after the story's end." Love At Absolute Zero by Christopher Meeks--Now Available! Love At Absolute Zero is about a physicist who tries to apply the tools of science to finding a soul mate. Specifically, Gunnar Gunderson, a 32-year-old physicist at the University of Wisconsin, gets a promotion, and all he can think of now is finding a wife, causing his research to falter. To meet Ms. Right within three days--that's what he wants and all time he can carve out--he and his team are using the scientific method, to riotous results. "Thermodynamics are nothing; it's that love thing that is so frustratingly hard to figure out. Love at Absolute Zero is an excellent read that is very much worth considering, highly recommended!" You can buy the book at Amazon by clicking here, and at Barnes and Noble by clicking here. Meeks didn’t realize his book Love At Absolute Zero was a finalist in ForeWord Reviews’ Book of the Year until weeks after the announcement. An ad exec had contacted him to see if he’d like an ad in their magazine. He didn’t know what she was talking about. 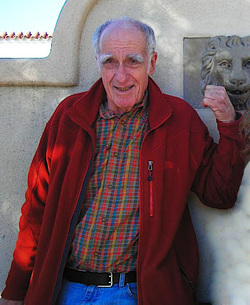 Gunderson, a 32-year-old star physicist at the University of Wisconsin. The moment he's given tenure at the university, he can think of only one thing: finding a wife. His research falters into what happens to matter near absolute zero (−459.67 °F), but he has an instant new plan. Channeling his inner salmon, he's determined to meet his soul mate within three days using the Scientific Method. publishers’ marketing departments each basically said, “We don’t know how to market it. Pass.” Finally McCarthy suggested to Meeks that maybe another agent would have other resources. McCarthy wanted to help and would call other agents for him. After a few more agents were cordial but stumped, Meeks stopped the cycle. He didn’t want to spend more years searching and waiting for the old system to work. He brought the novel out last September under his own imprint, White Whisker Books. The love story earned three earlier awards before ForeWord’s announcement: a Best Indie Romance Award at Red Adept Reviews, a Noble Award for Best Novel (not Nobel) at MyShelf.com, and it landed in the Top Ten Best Fiction list at Book Chase. a heartfelt study of the tension between the head and heart, science and emotion, calculation and chance,” says Marc Schuster of Small Press Reviews. booksellers and librarians in the process of discovering distinctive books across a number of genres with judgments based on their own authority and on patron interest. 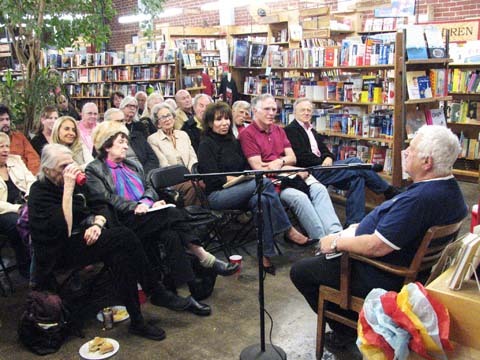 The 2011 Gold, Silver, and Bronze Award Winners, as well as the Editor's Choice Prizes for Fiction and Nonfiction, will be announced Saturday, June 23 at the annual American Library Association conference in Anaheim, California. To see ForeWord’s webpage for the book, click here. To buy a copy in print or for Kindle on Amazon, click here. To buy one for the Nook, click here. E. Van Lowe's new young adult series, The Falling Angels Saga, is rocketing toward bestsellerdom. Readers love these stories, and the first in the series, Boyfriend From Hell, is only $1.99 on Kindle and Nook and Smashwords. The second in the series, Earth Angel, is only $3.99. Click here to learn more about them and/or to download. Contact Form - If you have questions, fill this in. Boyfriend From Hell by E. Van Lowe--Now Available! Boyfriend From Hell is the first book in the Falling Angels Saga from the author of the gruesomely hilarious, Never Slow Dance With A Zombie. "E. Van Lowe's fluid and masterful writing made this book one that I needed to finish." You can buy the book at Amazon by clicking here, at Barnes and Noble by clicking here.